Books are my weakness. It doesn’t matter whether the book is fiction, non-fiction, or a pattern book, I love all books. I have been known to purchase a crochet book because I love one pattern in the book, and my crochet book collection is extensive (although I can always find a new book to add to my library). Because of my great love of books I cannot pass up a book sale, and I am delighted to announce that the Interweave Store is currently having a doozy of a sale! I was first drawn to Crochet Me because of the spectacular sweater on the cover and after reviewing the gorgeous patterns inside, I had to have a copy of this fabulous book. 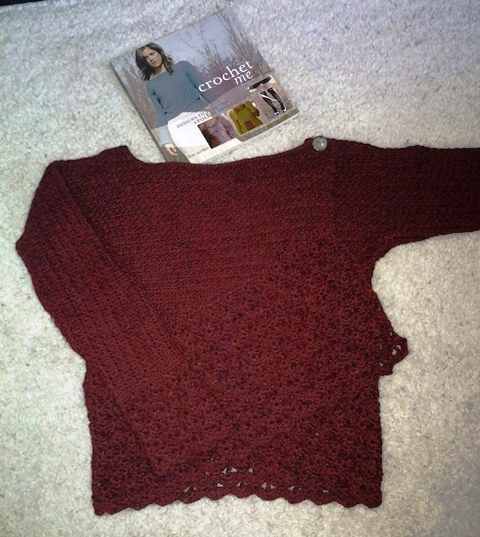 I immediately began work on Robyn Chachula’s Victorian Shrug + Wrap, and I loved how easy it was to follow the pattern. This sweater is one of the most comfortable and flattering sweaters I own and I wear it frequently every winter. As an added bonus I crocheted my sweater with alpaca so it is as toasty warm as it is beautiful. Because of my great love for this sweater, when I saw that Robyn had written a book, Blueprint Crochet, I knew that I would need a copy (without even seeing any of the patterns). When I picked up my copy of Blueprint Crochet I found it as wonderful as I knew it would be, and my only challenge was figuring out which fantastic design I want to make first. I have fluctuated between several different designs, but I have finally narrowed down my selection to the Maggie Wrap Top. Now that the hard part of selecting the pattern is over, I have the challenge of selecting the yarn. I have two color options in a fabulous cotton I love, or I might go a more traditional route and use a merino wool. Or, perhaps I’ll make two sweaters, one in cotton and one in wool. Regardless of the final yarn choice, I know that I will love this finished sweater and I cannot wait to wear it this summer. What about you? What are your favorite Crochet Me and Blueprint Crochet patterns?